The first round of Pat O’Brien cup games got the Boston Northeast 2017 season off to a great start at the Irish Cultural Center in Canton Mass. Weather conditions were good, though perhaps a little on the warmer side than we are used to in late April, and a stiff wind blew up as the afternoon wore on. Six football teams were in action, with each club almost having completed their home based rosters. Games were entertaining with some familiar names from recent years back in action on the fields of Canton, wins for Aidan McAnespies and Connemara Gaels in group A, while in Group B Wolfe Tones came away with the win. Aidan McAnespies had a good first outing of the season. Aidan McAnespies and the Blues got the action going with a few new signings impressing for McAnespies. Brian Breslin (Strabane) and Paul Clifford (Kildare) looked strong in the half back line, with Breslin popping over a couple of points, and at corner forward another Tyrone native, Che O’Donnell, proved very effective with 1-3 to his name by the time affairs concluded. Robbie Croft made the big move back to Boston, and playing in the middle of the field had a largely productive outing. Shannon Blues will be looking towards their outing against the Gaels. The Blues side featured some returning names from years past. Notably Darren Wallace and Barry Hartnett. Also coming in during the game was veteran Michael Ralston. The Blues played some nice handpassing football out of defence, but almost always came up against a stiff defence when in scoring range. McAnespies held a 0-6 to 0-2 lead approaching the break, and Ralston and Wallace reduced that gap to 2 points before the whistle. It was a late second half goal from O’Donnell that put the win in the bag for McAnespies to get them off the a good start. Macs: Paddy Coakley, Eoghan Delmer, Jimmy Rigney, Brian Breslin, Paul Clifford, Seamie Breslin, Marty Mongan, Robbie Croft, Cathal O’Neill, Niall Breslin, Tommy Brereton, Che O’Donnell, Russell Quirke. Blues: Daragh O’Shea, Fionn Herlihey, S. Henefy, Conor Kerins, Shane Kelly, John Craig, Barry Hartnett, Pat Murray, James Maher, Darren Wallace, Conor Mullen, S. Conway, Liam Henry. Next up were the westerners, Connemara Gaels and Galway. It was fairly tight all the way until the Gaels put some distance between themselves and their opponents in the final quarter of the game. Kieran Killeen gets the Gaels going. There were lots of familiar names on both rosters, with Coleman Mulkerrin featuring well for the Gaels and Kevin Cummins for Galway in the early going. It was 3 a piece after 10 minutes, before PJ Connolly from Leitir Mór netted for the Gaels after a great Ryan Caffrey run. James Doyle responded with a point for Galway, but another point from Connolly had the Gaels sitting on a 4 point half time lead. Galway opened the second half with a fine goal from Tom Walsh. Cummins found his teammate on the corner of the square with an unorthodox pass from the outside of his boot, and after the fetch Walsh buried the ball on the near side of the posts. Kilmacud Crokers man, Peter Herlihy, leveled matters with a point, and it was all to play for down the stretch. The Gaels ended with 5 unanswered scores as they stepped up the pressure. The wind picked up and helped the Gaels with their efforts, as did Ciaran Killeen who sparked the team with a point, and set up a goal for Sean Conneely, to see the Gaels to the win. Gaels: Paddy Sweeney, David Black, Niall Collins, Damien Doolan, Ian Heanue, Ciaran Killeen, Ryan Caffrey, James Flaherty, Coleman Mulkerrin, Paddy McGee, Sean Conneely, Patrick Connolly, Gabhain McCrystal. The final game saw Christopher’s take on the Wolfe Tones. The Tones ran away with a 9 point win, but not without a fight from Christopher’s for much of the game. Christopher's Dan Kenneally lines up a shot. Gavin Walsh opened the scoring for the Tones, who had Gerry Troy and Jarlath Boyce anchoring midfield. The scores flowed for Tones though Mike O’Brien, Shane O’Rourke and Cormac Joyce-Power. With Ferghal O’Brien playing well at corner back and Daniel Courtney in the middle of the half back line, the Tones were well on top of affairs. A goal from O’Rourke (Kilcock) put them in the driver’s seat as Christopher’s tried to get themselves back into the contest. The Tones' Daniel Courtney with Murt Hunt in pursuit. Opening the second half down by 7, Christopher’s made things interesting with three points on the trot from Dan Kenneally, Shane Dooey, and Paddy Manning. A goal chance that that would have put Christopher’s right back in it after Dooey opened up for himself, was well saved by Shane Hayes. The Tones steadied the boat with Tones veteran Joey Farrell popping over a couple of scores after entering as a substitute, as the Tones saw themselves through to the win. Christopher’s: Mark Delaney, Martin Coppinger, Sean Coppinger, Paudie Kenneally, James Horgan, Denis Dempsey, Jerry Kenneally, Shane Dooey, Paddy Manning, Murt Hunt, Patrick Kerrigan, Dan Kenneally, Paul Bannon. Tones: Shane Hayes, Keith Gill, Darren McDonnell, Ferghal O’Brien, Daniel Courtney, Darren Maguire, Gerry Troy, Jarlath Boyce, Cormac Joyce-Power, Mike O’Brien, Cathal Moriarty, Shane O’Rourke, Gavin Walsh. Saturday April 29 sees the beginning of the 2017 GAA season at the Irish Cultural Center. The Pat O’Brien Cup features 3 games with the defending champions, Connemara Gaels, taking on last year’s championship finalists, Galway. 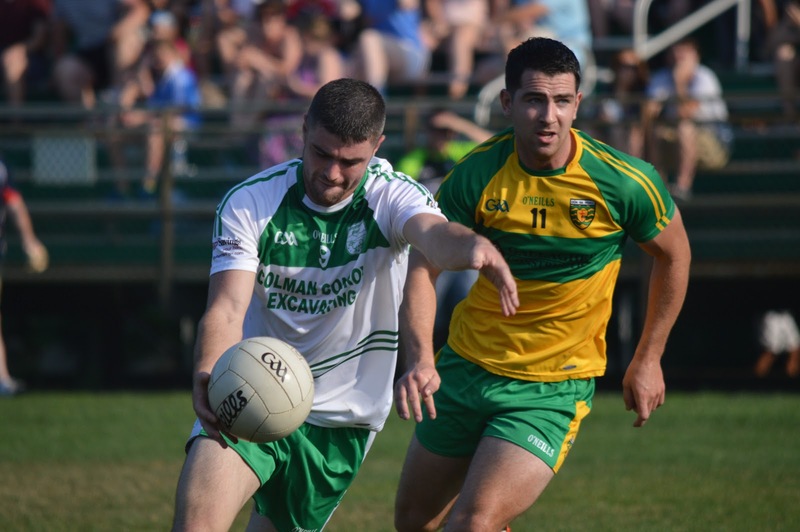 The other ties see Donegal take on Wolfe Tones and Aidan McAnespies play the Shannon Blues. The cup takes on a new format with each team playing the others in the group, and at the end of group play the top teams will play each other in the final. The format ensures at least two games for each club before the Championship begins on June 4, and clubs have the chance to get their home based players back into the swing of things, and to blood some the many new home based signings. Group A: Aidan McAnespies, Shannon Blues, Galway, Connemara Gaels. Group B: Donegal, Wolfe Tones, Christopher’s. 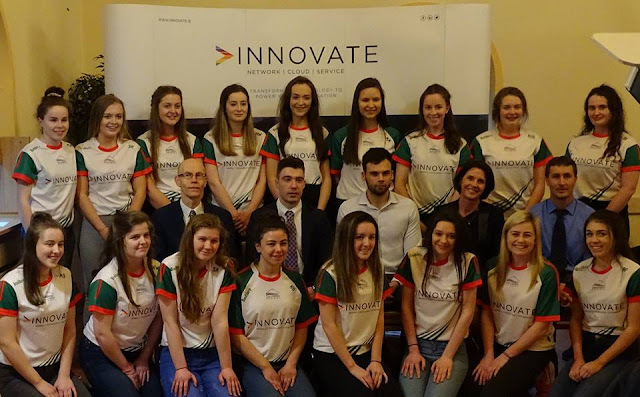 There will also be a fundraiser at the ICC on Saturday evening for the U14 teams that will be participating in the Feile at the end of June in Ireland. The competition is a trip of a lifetime for underage players, who put in a tremendous effort preparing for the competition, and the prospect of traveling to Ireland and being part of the team really bolsters the underage programs in the region. It is a large expense for a family to travel and a successful fundraiser helps defray some of the cost. So, next Saturday is a chance to enjoy some early season action and get out to not only support the home based players, but to give the youth support and enjoy some music and Irish dancing at the fundraising event. 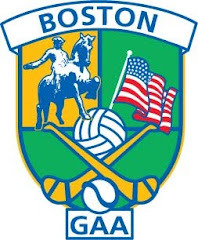 The Boston GAA season begins on April 29 with the commencement of the Pat O’Brien Cup. The competition will take a group format with the seven teams who entered drawn into groups of 4 and 3 teams respectively. After the groups have been completed the top team in each group play for the cup. Group A: Aidan McAnespies, Shannon Blues, Galway, Connemara Gaels. Group B: Donegal, Wolfe Tones, Christopher's. Provisional Date for final May 20. Games may need to be rescheduled due to weather. Championship begins June 4. The U14 Boys and Girls are training diligently for the Feile competition to be held at the end of June in Cavan, Monaghan and Fermanagh. It is yet to be determined where the teams will be based. A fundraising event will be held on April 29 at the ICC to help defray the cost. 2016 was the first year that a team traveled from Boston in 8 years, and the trip was a resounding success with the team reaching the quarter final. Auction and raffle items are needed, and your support is greatly appreciated in sending these kids for a trip of a lifetime. It will be an evening for Wexford people at the ICC Tuesday night. A team from Gorey Community School in County Wexford is on a trip to the United States and will be visiting Boston next week. The Wexford youngsters will play a Boston U16 and minor team in football and hurling on Tuesday April 11. The games will commence at 5:00, followed by a reception for the visitors from Wexford. Come down to the ICC Tuesday evening and welcome the kids!